Posted on January 24, 2016 January 25, 2016 by SherylPosted in FoodTagged apple, meat, pork chops, recipe. The pork chops are yummy. I just wrote a recipe using pork and apples great minds think alike Sheryl!!! Very nice! 🙂 Somehow pork chops seem like a wonderful comfort food this time of year. I’m looking forward to reading your recipe. Hi Sheryl, it should post on https://thewisercook.wordpress.com on January 29th, 2016 early a.m. I agree pork is a wonderful winter time comfort food! Thanks for the link. I’ll look for it on Friday. OMG! That looks delicious — and just when I’m hungry for dinner. Looks so good, your picture that is!! The black and white doesn’t make the dish very appealing. The first time I tried apples with pork I was a bit hesitant, but I was pleasantly surprised. I was a guest at the table with no choice but to be polite. Good thing other wise I might of passed it by! I’ve have had similar experiences where I’ve tried new foods because it was the polite thing to do –and discovered that I had been missing some wonderful taste experiences. It’s nice to hear that you enjoy them. Love that baked apple on top! It was very visually appealing with the apple on top. It seems like there was an assumption back then that cooks were very experienced, and only needed the sparsest of instructions to replicate a recipe. I realized awhile back that different cooks could interpret many of these old recipes in different ways, so I started also including the original recipes in the posts, so readers had the option of making their own interpretations. I will definitely add this one to my collection. Sage always reminds me of the pork chops and cornbread stuffing mom made. Hope your readers will check out my site too for my pork chops and pears recipe. I wonder what other fruits pair well with pork? mmm. . . your mother’s cornbread stuffing sounds wonderful. Now that you mention it, this recipe does almost have an “essence” of stuffing with the sage bread-crumb coating but without as many extra calories. Your pork chops and pears recipe looks awesome. I think you are right that pork chops pair well with fruit. I also like to serve them with Crab Apple Chutney or Apple Relish. You win. Off to the market down the hill for ingredients v got to have this one for dinner guests tomorrow and at the end of the week. Yum. The Apple makes it!! I think that you’ll enjoy this recipe. You’ll have to let us know how they turn out. From the comments I’ve read, it seems as though lots of you are surprised about the apples with the pork. 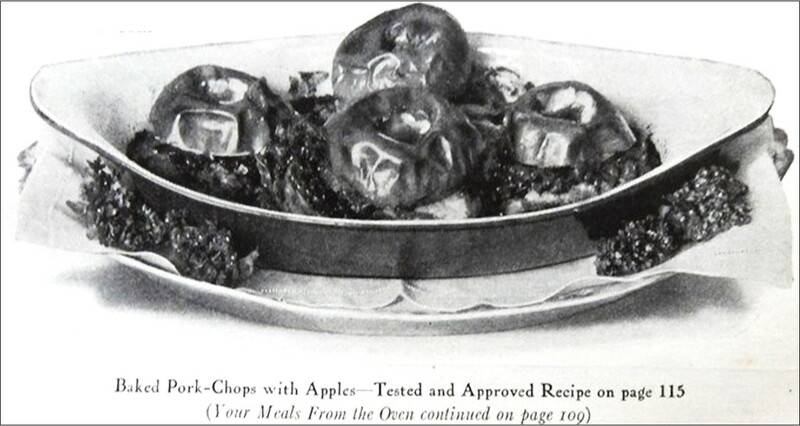 In England it’s very common to serve pork with apple sauce, or other apple-y relishes . So this recipe’s not such a stretch as it seems to be over there. What’s a more common accompaniment to pork for you? hmmm. . . It’s popular to put barbeque sauces on pork. People also often eat pork with no particular accompaniment. In some regions, sauerkraut and pork are popular. That must be all your teutonic influences, I suppose. Pork’s good with so many things! I like apples with pork. I wonder if the baked apple gets mushy? Or maybe just like apples in a pie, depends on what type of apple used. I made pork with fried apples (in the pan that cooked the pork) for the first dinner that I made when I was dating my husband. But pork in the summer is good too, especially on the grill with barbecue sauce! 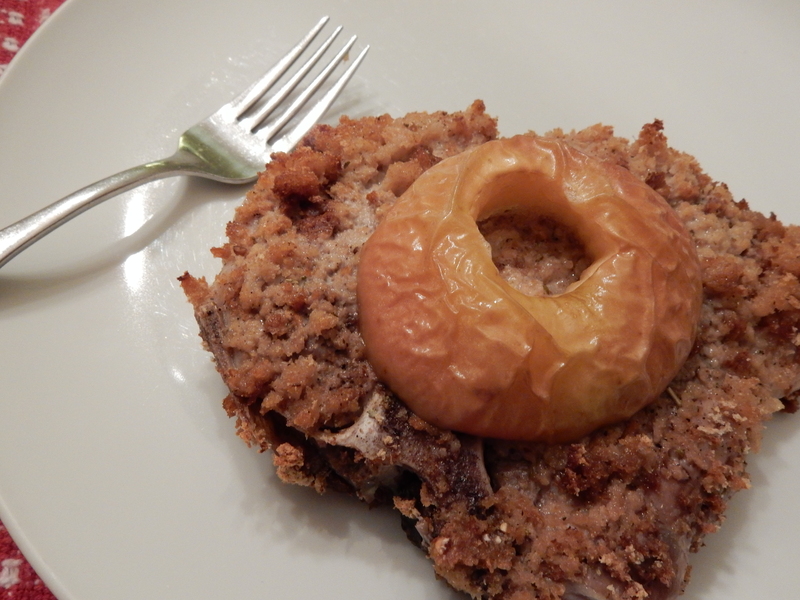 I think it is interesting that the apple cooks right on top of the pork chop. At first I thought it was placed on top after baking. Sounds delicious. It worked just fine for the apples to cook while sitting on top of the pork chops. The apples were tender by the time the pork chops were cooked. Wouldn’t you still want to put a little butter in the center of each apple to help brown, add juice, etc.? Good question – I did put a dab of butter (about a teaspoon) in the center of each apple. I revised the wording of the recipe a little to make it clearer. I didn’t add any juice or water. The original recipe called for adding a little water when the crumbs are brown, but when I made the recipe it didn’t seem like any was needed (though I won’t hesitate to add water if it seems too dry). Love pork chops all year long. Some of the best I’ve had were at a Russian restaurant, topped with cherries and a cherry sauce. mmm. . . This sounds like an awesome pairing. My mouth is watering. Pork and apples are a perfect match. Interesting that the apple is baked right on the pork chop and still the coating doesn’t look soggy at all. I didn’t have any problems with the coating getting soggy. It’s important to use an apple variety that holds its shape and doesn’t get mushy. I used Braurburn apples. Tonight we are having pork chops baked with sauerkraut. You have inspired me to have applesauce for dessert! mmm. . . I wish I was at your house. Sauerkraut and pork make a wonderful combination. The pork and apple combination was wonderful! It’s interesting how the spelling of some words changes across the years. I swear, every time I read your blog, I get a blast from the past! I think my grandmother had the same cookbook . . . Your comment made me smile – and think that I am doing something right. You have such a wonderful way with words.